Announcing SDI, Sounds Effects PRO, for the Home Movie producer. 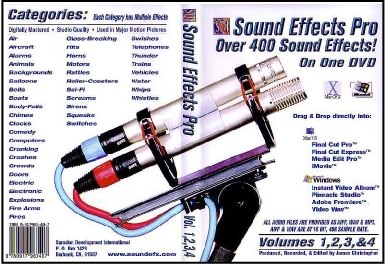 This DVD contains over 400 Sounds effects by award winning Editor James Christopher. The package contains volumns 1,2,3 and 4 of his Sound Effects Collection. File are presented in AIFF and WAVE and MP3 file formats in Stereo 48K sample rate 16 Bit Audio. These Drag and Drop Sounds effects are perfect for Final CutPro, Final Cut Express, iMovie and other compatible movie production programs. Click here for complete list of the Sound effects on this DVD. copyright ©2019 artsci publishing all rights reserved.